SAN FRANCISCO — Before Wednesday’s game, Giants manager Bruce Bochy said the staff is considering skipping Matt Cain’s next start so the top three starters are lined up for a series that begins Tuesday at Dodger Stadium. For four innings, it looked like Cain would alter that thinking. By the end of the fifth, the rotation change seemed a lock. Cain allowed six runs in the fifth inning, giving back a four-run lead and more. The Giants lost 6-5 to the Pirates. They have been swept three times in the second half and have a 9-21 record. A pair of RBI extra-base hits by Brandon Crawford helped the Giants build a 4-0 lead. Cain cruised through the first four innings on just 52 pitches, allowing just a seeing-eye single and striking out four. The wheels came flying off in the fifth. Cain opened the inning by plunking David Freese, and walks of John Jaso and Jordy Mercer loaded the bases. 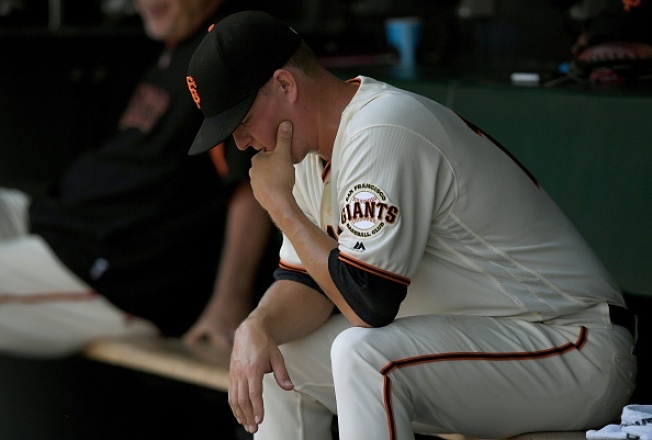 Cain walked backup catcher Eric Fryer to put one run across, but the Giants were slow to respond in the dugout. A two-run single by pinch-hitter Matt Joyce cut the lead to one, and Josh Harrison’s sacrifice fly tied the game. Bruce Bochy stuck with Cain and got burned, with Andrew McCutchen lining a two-run homer to left. That finally ended Cain’s nightmare inning. It was all quiet from there until the ninth, when the Giants loaded the bases with no outs. That just made the loss sting a bit more. Buster Posey hit into a double play and Crawford flied out. Starting pitching report: Cain has gone backwards since back-to-back scoreless outings against the Nationals, allowing 11 runs in 8 2/3 innings on this homestand. Bullpen report: Jake Peavy saved Jake Peavy by getting a couple of swinging strikeouts with two runners in scoring position. In seven relief appearances, he has allowed just one run. At the plate: Gregor Blanco was 0-for-August before a hard single up the middle in the sixth. It snapped a hitless streak of 19 at-bats. In the field: The Giants who reached first base seemed amused by Jaso, maybe because of his hair. Attendance: The Giants announced another sellout. A good chunk of the crowd left after McCutchen’s homer. Up next: Madison Bumgarner vs. Jacob deGrom. Doesn’t get much better than that.